For our Artist-Master, Collector-Premier and all Organization level accounts, Artwork Archive provides the ability to add additional user types. The first is an Admin user that will have full view and editing rights. The second is a View-Only user that will only have the ability to view the account without having any ability to edit. This second account type is particularly useful for executives or key stakeholders that want access but don't need to the ability to add or edit data. Go to your account settings in the upper right-hand corner and select account. 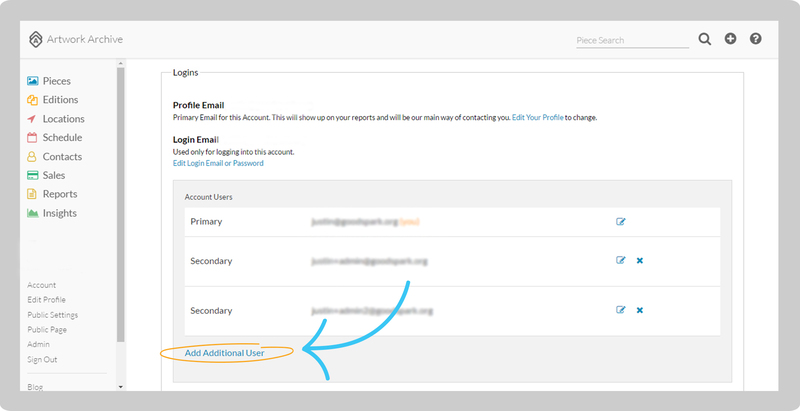 Once on the Account page, you can click the Add Additional Users button. This will give you the option of creating a new user and assigning a username (their email) and password. Once created, you can email the login and password information to the new user or communicate it directly. Note: If you wish this user to only have view access, please make sure to check the View Only Account checkbox. If you wish to remove a user, go to your account settings in the upper right-hand corner and select account. 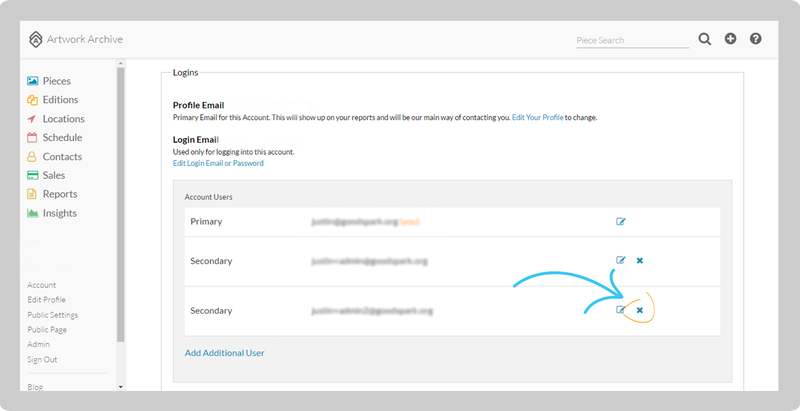 Once on the Account page, you can view the additional users and select the X to the right of their name to delete them.